The 2nd of October 2005 our rebuilt replica of the East Indiaman Gotheborg is leaving Gothenburg for her voyage to China. In a few moments she will safely pass the exact location where the original hit on a reef and sank in 1745. During the last few years of the excavation phase Anders Wästfelt had in 1990 begun to include the idea of building a full scale replica of the original ship Gotheborgin his presentations at the excavation base camp. In October 1992 the idea was worked out enough to be presented. During 1993 I officially joined the project Management Group. Together with Anders Wästfelt we set out to launch his multifaceted project that we knew would fit very well with our conviction that China were just steps from entering the world as a very important trade partner. We were convinced that this project would present a unique opportunity to re-connect the Swedish export industry at large to this rapidly developing market. The large Swedish export companies were there alright, struggling along, but in the early 1990s this was far from the common understanding of things. To most, China was far away and of interest only for those that was taken in - or abhorred - by the Chinese 'Mao-ism' and the Cultural Revolution (1966-76). It took an active interest to see what was going on, on the East and Southeast Asian part of the Pacific Rim, to be aware of Deng Xiaoping and his plans. To the Swedish import and export industry the creation of the Special Economic Zone around the hitherto sleepy fishing village of Shenzhen, just across the border from Hong Kong, was changing the map of international trade. Art Historians on the other hand was worried that what the Cultural Revolution had failed to destroy of the Chinese history, the economic and industrial revolution would do. Foreign investment was now welcomed into China and foreign technology was brought in, and of course copied, and the economic growth was attracting momentum. We were convinced that our ship project - that aimed to re-connect our traditional good and peaceful trading relations with China, and that would send a trade delegation of a kind the world had not seen in hundreds of years, smack in the middle of this economic zone - could be a sensational success. I must say again that what we saw back then was not a common knowledge. Through my membership in the Gothenburg 'Shanghai-Gothia Club', created as a result of the friendship 'sister city' agreement signed between Shanghai and Gothenburg in 1986, and a network of cultural and commercial experts and advisors, we had a rare understanding on what was going on in China at this time. Eventually we got the project going. Chinese delegation after delegation visited us, they came, looked and eventually dragged their unwilling Swedish hosts to see what we were doing - maybe the grandest friendship gesture ever made between any country and China - that was genuine from the ground up and not initiated nor run by any official authorities. Chinese delegation after delegation came, looked, and eventually dragged their unwilling Swedish hosts to see what we were doing. 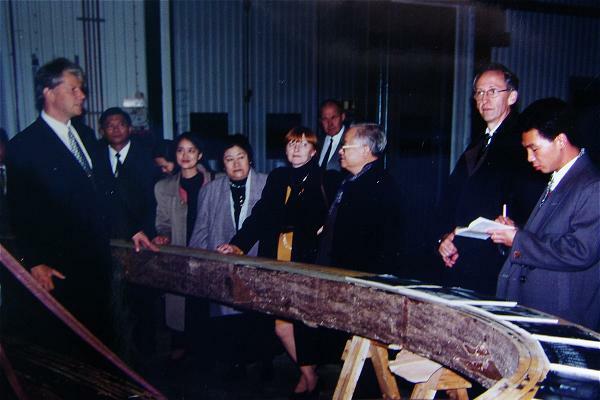 From the left, Jan-Erik Nilsson outlining the rib manufacturing process to the Major of Shanghai, Xu Kuangdi with entourage. To the far right, Nils Olof Ericsson, official interpreter to the Swedish Ministry of Foreign Affairs. In the middle background Bo Alfredsson, CEO of our own building company, the SOIC AB. It was and actually remained a completely private initiative, run by a handful of people who were volunteering their work, and still going down to the shipyard and working for it on a daily basis. With - and that need to be said - the support of a very large number of knowledgeable friends and advisors, upwards of a thousand small and large sponsors and many private individuals. Eventually the official Sweden warmed up to the idea and eventually started to promote our project as their own. Maybe this was inevitable and maybe that was what we ultimately had wanted however, we were not ok with the ham handed way it was presented, or pushed through. We can even set a date on, when we got this 'offer we couldn't refuse'. However the project wasn't ours to give away just like that, so we of course refused, and of course that didn't change a thing. Still things worked out pretty well. Eventually the ship got built and between 2005-2007 made its spectacular voyage to China and back that we had planned for. Today I don't think anybody feel anything but pride about this project, and that this ship was actually built and actually conclude its travel to China and back. I also think it did accomplished much of what we wanted anyway. Here I have tried to put down a brief history of how this remarkable project came to be and some on how it was followed through. Most every other aspect has been covered by other sources, countless books, TV-programs and interviews, thousands of newspaper articles and I believe even a couple of movies, in both Chinese and western media. Everything is pretty much covered except how, by whom, and why, it was actually started. What we knew for sure when we started this in 1992 was that it would become a very beneficial project for a lot of people, and maybe make the world a little better place, if we could swing it. 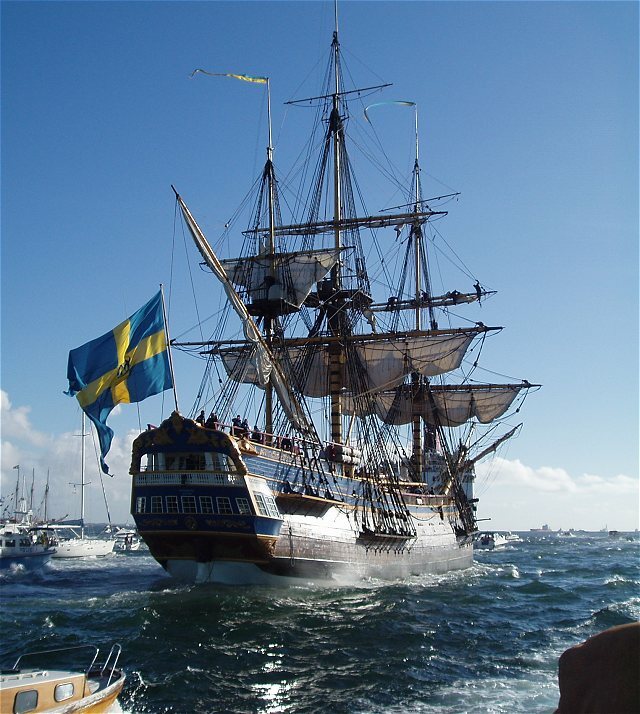 And that we would call it the The Swedish East Indiaman Gotheborg III Adventure. This is the story on how it begun, and how the whole thing worked out. Currently my big heroes are the people who knew how to put this beautiful ship and the historically correct rigging together, and those who now actually are sailing her.